Often with machines there will be those who are passionate about them in some form or another, they may be those who tinker with machines as a hobby for those who put serious investment of both time and money into said machines. In Darmonica they are known by many names, Gearheads, Scrappers and Canners. This week is their moment in the spotlight. The term 'Gearhead' is often used as a nickname for those who like to tinker with machines, almost all Gearheads are mechanics but not all mechanics are Gearheads. A normal mechanic simply repairs and keeps a machine running, a Gearhead goes the extra mile to improve said machine by trying to increase its performance. Unsurprisingly given the current popularity of air travel that alot of Gearheads are aircraft mechanics, especially those involved in the air racing circuits. Very few Gearheads can be found in military service and when they are found in the Service they're often posted to remote bases where they can do the least amount of damage. Gearheads are more likely to be found in independent outfits or places like Broken Spires, ones of looser morals can find easy employment amongst air pirate gangs. Less common are Gearheads who specialize in car, trucks and other land vehicles as their work is more limited to keeping the vehicles running rather than boosting the engine power particularly out in remote regions. Virtually unheard of is Gearheads onboard ships, though they do exist in limited numbers. The demand for spare parts is often greater than the supply, this is where Scrappers come in. Scrappers are basically salvage-men, with wreckage of war machines still littering the old battlefields they are doing good if sometimes illegal work. They keep a sort of grey market for spare parts well supplied with pieces they've managed to scavenge from a wrecked tank or crashed aircraft, some work may be required to bring said parts up to standard but you get what you paid for. Lastly there are the men women dubbed 'Canners', similar to aviators except the craft they pilot are land based contraptions such as Walkers which are effectively walking tanks and Mechsuits which are primitive suits of power armour. The nickname Canners comes from both Walkers and Mechsuits being called 'Tin Cans' (often not in a good way), though the Canners wear the name as a sort of badge of pride. Canners are often found in independent outfits, though they are also found in military service but are often loners and outcasts in their units and are usually considered to skirt the borderline of insolence by officers. The most famous Canners are the pilots of the Artian Mechjager Divisions, the bane of many armoured units throughout the War. Now I've talked a bit about the Ancient Terrans, that their civilisation collapsed centuries ago and some of their stuff was left lying around. Of the latter I've never really gone into much detail, so this week I seek to address that and offer some fodder for your games. Without a question the most visible remnant of the Ancient Terrans is the frost-coated, crumbling ruins of what were once their cities and outposts. They are spread far and wide, many believe that some are even located beyond what has been 'explored' of Alyeska today and back up their claims by pointing to what appears to be the remains of a rail network. Others have even claimed to have found wrecks of Ancient Terran skyships, though if this was proven true then it would reinforce the theory of the Ancient Terrans' technological prowess and explain how their empire once covered large parts of Darmonica. Elsewhere in Darmonica virtually all of the old ruins have been used as the foundations for modern towns and cities, adapted in some cases as sewers or just left as a warren of tunnels beneath the city streets.The same has happened in Alyeska, but on a much smaller scale and as such there are many ruins left virtually untouched. Amongst academic circles the Alyeskan ruins are considered prime sites for study, a lot of the ruins however lie within the Wulfland but hasn't stopped the odd researcher with more money than sense. The most notorious of the Alyeskan ruins has to be the Monolith and, by extension, the Great Stones of the Chillwynd Marches. To this day nobody has found out why the Ancient Terrans decided to carve out a completely flat plain that forms a perfect circle, nor the purpose of the standing stones that ring it in an exact copy of a clock-face. Located at the exact dead center of the Marches and rising high into the sky like a spire stands the Monolith, this great structure has many mysteries contained within and a grim reputation for madness. Much like Marches that surround it, people have vanished without a trace in the Monolith as well. There are others, sole survivors of missing expeditions, that have returned with their minds broken by whatever they'd encountered and either wind up dead or eventually vanish. *Nobles and successful businessmen of the upper classes are only interested in relics and artefacts to use as display pieces and show off to their peers, though it can and has been a very cut-throat business. *Scientists are only interested in items that look like devices, usually with the hopes of discovering a 'new' technology. *Unsurprisingly the military is interested in anything that could be used as a weapon, though since the end of the War it has become a rather low priority. 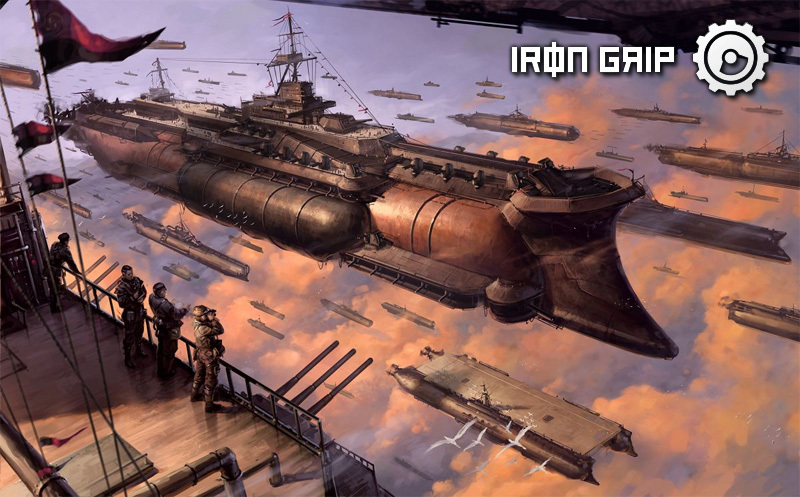 Out of all the Darmonican nations it is really only the Iron Collective that is actively seeking out any and all artefacts that it can get it hands on, though the Coalition comes a close second. The Ancient Terrans have been gone for over 1800 years and only left behind crumbing ruins right? Now this where things get a little murky. There have been reports over the years from those who've been exploring larger ruins, such as the Monolith, of being 'stalked' by somebody or something. They speak also of shadows briefly glimpsed, of footsteps heard that cannot be accounted for and even attacks by unseen assailants armed with unknown but very advanced weapons. Whilst many would simply dismiss as Windryders or self styled 'prospectors' trying to scare people off, the accounts rather alarming match one another on all they key points. Could there be some actual Ancient Terran Remnants lurking in the ruins of their fallen empire? Even after all these years? Nestled in the north-western corner of the Alyeskan Outlands between the northern coast and the eastern boundary of the Chillwynd Marches is the town of Prospector's Reach. It was bit of a poor reputation, it is cold grey virtually all year round and occasionally the whispering winds of the Marches blow in the town's direction. The townsfolk themselves are somewhat isolationists, surviving either as ice fishermen out on the frozen sea to the north or as wilderness hunters and fur trappers ranging to the south and east of town. None of the townsfolk dare venture into the Marches, those living on the western or 'Marchside' of town keep their west facing windows permanently shuttered. Lying only a scant few miles from the Marches people do occasionally vanish during the night in town as they do out on the frozen plain, locals dubbed this as 'being taken by the winds'. Every month a new expedition to explore the Marches assembles in town, a new of businesses has sprung up to cater to these adventurers. Hotels, taverns, stores and workshops offer their services to those intending to set out west. In addition there is a sizeable mercenary population in town of guns-for-hire who offer themselves as guards both for expeditions and the trade caravans that cross the wilderness from the town of Purpleflint. Prospector's Reach does, like most settlements, has its own airstrip but the winds from the Marches and blizzards that blow in from off the frozen sea makes life difficult for aviators and so its not a favourite destination for pilots. Travellers typically arrive overland via the weekly trade caravans, though there are proposals to build a railway line out to the Reach but as of yet nothing as materialized. Prospector's Reach is not a place that anyone actually wants to go to, most folk are usually planning on heading into the Marches in search of Ancient Terran artefacts that are rumoured to lie within the towering spire known as the Monolith. A lot of them return empty handed, some bring something that may prove to be of worth and the rest never return at all. First post of October is a news/update one. Sort of bad news in a way to begin with, least it gets it out of the way first. Everyone's aware of internet piracy, primarily from the media amongst other things. Most people are probably aware of dozens of RPG PDFs that are floating around on the web, an issue for anyone selling digital products. I've regularly done Google searches to see if any of mine turned up on sites other than DriveThru. Couple of days ago I found the Frozen Skies Setting Primer on a file sharing site. I put in a copyright infringement claim on the website and contacted DriveThru about it, quoting the buyer's name and order number in the PDF's watermark. As you can imagine I was more than a little annoyed about it, especially since I'm making a pretty low return on my products as it it compared to the time and money that went into producing them. Even more so considering that the Setting Primer is technically FREE through DriveThru unless you want to support the publisher, which is the beauty of Pay What You Want. Tis the first and only incident I've encountered, so I'm not going to be making any changes now or in the future. I'll continue to do some PWYW products and other products that'll have a reasonable price, unless I find piracy a major problem for me (end of the day my RPG may end up being my only source of income). I get that some people will have virtually no money to spend on things other than bills, food, etc which will be a factor in how I price products, though I am happy to offer discounts for people on a case by case basis. Those who follow the Facebook will/should already know that I've setup a Patreon with the view to help raise funds to get Frozen Skies completed. It'll be an ongoing thing and even if you just pledge a dollar a month it'll go a long way. 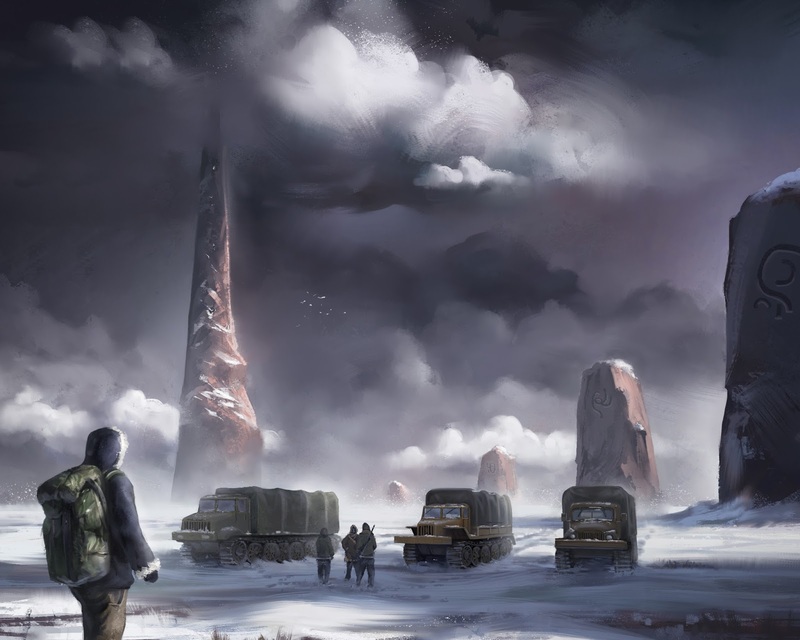 And finally the latest bit of artwork for Frozen Skies, an expedition entering the Chillwynd Marches and the towering spire of the Monolith in the background. Tis what all you fledging Skyship captains have been waiting for, rules for using Skyships in your games of Frozen Skies/Savage Worlds. Use the Chase rules as found in the Savage Worlds Deluxe rulebook as normal, though use the Piloting skill as rolls concerning Skyships. Group crew rolls also work, each success and raise adding +1 to the captain's Piloting roll and a -2 penalty if they roll a 1. Skyships also suffer damage like normal, though if they go Out of Control they do not suffer a Flip result (they suffer a Slip instead). On a Roll Over result the Skyship still performs a Slip but lists rather than roll over. Roll collision damage for everyone inside, those out on deck must make Agility rolls to avoid falling overboard unless they happen to be wearing a parachute. Wrecked Skyships simply sink, typically at a rate of 6d6 minutes. It'll also drift 1d6" and the GM can roll 1d12 for direction. Characters can jump off a sinking Skyship long as they have a parachute. The B-Class frigates first saw service halfway through the Great Darmonican War as a replacement to the earlier A-Class that was in service at the beginning of the War. The B-Class were particularly good as raiders, typically operating in packs of three to provide mutual support to one another. If they managed to capture a prize one would take it under tow whilst the other two would act as escorts. They have now steadily been replaced by the newer C- and D-Class frigates, as such many B-Class frigates have been assigned either to remote outposts or relegated to patrol duty. A sort of follow-on from a couple of weeks ago, this week we're taking a look at Skyships in Alyeska itself. With Alyeska being a frontier land you can imagine that Skyships aren't exactly common here, there are few trade consortiums active in Alyeska mainly due to the storms that near-constantly wrack the Mhór Farraige (or Great Ocean) and the Continent's more local problems. The Skywrights Guild are presently the only ones to successfully and regularly operate a Skyship between Alyeska and the rest of Darmonica, thus providing the only reliable lifeline to the Continent. However many accusing the Guild of greed and hiding a secret route through the storms the Guild's Skyships do still suffer damage during the crossing, so at the moment the Guild crossing is only twice a week and their Skyships can regularly be seen docked for repairs. The Guild also owns and operates much of the facilities for handling Skyships in Alyeska, save for the one owned by the Commonwealth's military for its Skyship Squadron and one or two independents. The Guild, in effect, has a monopoly. This is due to the Guild keeping much of the knowledge of the technology behind Skyships a secret and the stranglehold they have on Liftorium or 'Lift Gas' as its known. Not only is Lift Gas needed in order to make the Skyships work, its effectiveness as a lifting agent gradually deceases each time it is charged and de-charged. It comes to a point where it ceases to work altogether after steadily requiring more and electricity in order to produce viable lift, ideally Lift Gas needs to be replaced before this point. The Guild has ensured that it is virtually the sole supplier of Lift Gas, chiefly by buying out the various mines and refineries needed for its production. There is a black market in Lift Gas, usually whats been siphoned from someplace and often of dubious quality. At present there are only a handful of Skyships active in Alyeska, most of these are cargo ones operated by the Guild on behalf of the Aerial Corps. 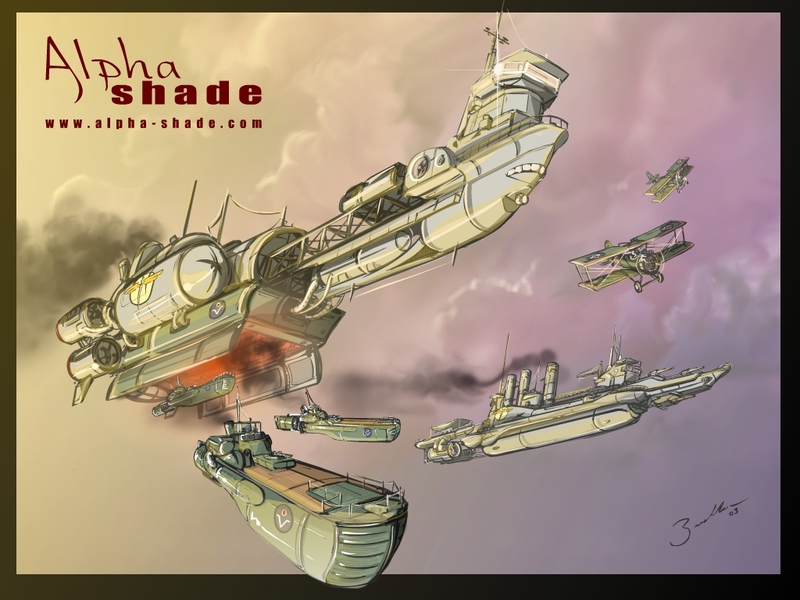 There are one or two operated by pirates or independents, though these aren't seen that often due to the resources required to keep these Skyships in the air. Finally there are the three frigates operated by the Commonwealth military named, Battleaxe, Brilliant and Broadsword respectfully. These Skyships form the Alyeskan Skyship Squadron and one can be seen on any of the following duties at any one time such as patrolling the Wulflands, patrolling the Alyeskan coastline and on station over Gravenberg. Been a while since I've done one of these. Not scheduled to attend any further events this year, aside from maybe some Frozen Skies one shots for playtesting (keep an eye on the Facebook page for details). Next is going to be....interesting. The girlfriend and I are expecting our first child in February, which is understandably going to have an impact on things. After some discussion we decided that, mainly, due to logistics we won't be attending UK Games Expo next year unless anyone has any bright ideas. Its a bit disappointing since its our biggest event. We WILL be attending Diceni in Norwich and ExiliCon which is slightly further afield in Cambridge, both are one day events which we know don't present any problems with logistics. There are also a couple of other events we're looking at, but its dependant on various different factors. Slowly getting some funds sorted and got the artwork for Frozen Skies rolling again, though more on that in a moment. Been looking again at Crowdfunding and the various different options on offer, increasingly I've been drawn to Patreon. Its Crowdfunding that works a little like a subscription service, you pledge however much you normally would like Kickstarter and this is effectively a subscription fee that gets paid on a regular basis. I'm looking at doing this for the blog posts and have a choice of whether its paid per post or per month, though I'm leaning towards it being a monthly payment. Ultimately any earnings from this will be put towards Frozen Skies. People's thoughts and comments will be most welcomed on this. So heres a WIP snapshot of the latest piece, a Windryder and their Dragonhawk mount. Summer has arrived somewhere in the Northern Hemisphere and we're past the Summer Solstice, though instead of referencing a pastime involving stately seating I shalt delve into how things are with Utherwald this month. First up is the news that an adventure written for Fabled Environments has now been released and is called Voyage of the Sky Maiden. It involves a heist onboard an airship and is setting generic, perfect as a one-shot or convention game. Posted on the Pinnacle forums is a Frozen Skies survey, chiefly to get people's thoughts on certain aspects of the setting, etc. I cannot overstate how useful and important people's responses are, especially since the feedback will help shape Frozen Skies and effect the setting's development. So please read through and post your thoughts. Hoping to have a good chunk of Frozen Skies' artwork done over the summer, the artist is currently on holiday and so its a case of sorting out the various odds and ends involved with producing a book. If the current funding keeps up then I probably won't go the crowdfunding route, though I still can't commit to a release date yet. 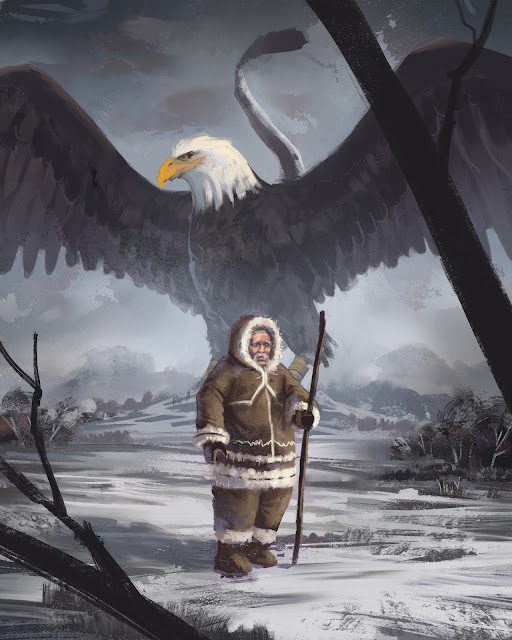 The Frozen Skies primer is still an option, people's feedback have been that they prefer fluff over mechanics and so the primer will be a basic guide to the setting. More adventures are planned, The Lost Sodkan Mine is in the works and there is the possibility of another adventure for Fabled Environments. So finally got the chance to see Mad Max: Fury Road. It rekindled an idea I had for a convoy system for the Realms of Darmonica setting (of which Frozen Skies is part of), though its always taken a backseat to Frozen Skies. Some of the adventures I envision taking place in the world of Darmonica I view as the players being part of an outfit with a vehicle, either an aircraft or some sort of ground vehicle. Both generally will have the same format with pilot/driver, mechanic and dedicated gunners/fighters for defence. There is the optional support staff like the moneyman, etc whilst ground based outfits lean more towards being convoys with dedicated scouts, navigators, possibly even a commander who's in charge and perhaps a radioman. Now the mechanics for a convoy system are more likely to be included in a general Realms of Darmonica core book, Frozen Skies is really more of a region guide/supplement and has a different scope. Thats not to say that convoys won't work in Alyeska, after all aircraft can only carry so much and railways are rather thin on the ground. Convoys could also work wonders for expeditions, or a relief column as part of a military game set in the Wulflands for example. The Mule works, though more vehicles are going to be required and I do envision 'rigs' which are effectively a road train. Each trailer of the rig (chiefly when travelling through dangerous areas) are likely to have what are basically turrets or gun positions, either a fixed machine gun or firing point for a rifleman. Again convoy rules and the extra vehicles are unlikely to be in Frozen Skies, though if you wish to do a convoy based game then use the Mule, trucks from Deadlands Noir and the Semi in the Savage Worlds Deluxe rulebook (though limit it to three trailers each with a single 'turret'). At this year's UK Games Expo I ran the Lost Sodkan Mine adventure thats currently in the works, though featured a number of tweaks since I last ran it. In the run-up to UKGE it was fully booked with all six places filled, even met a few of the players beforehand. However on the night only three of the players turned up, no idea what happened to the other players even though I did meet one of them whilst trading on the Friday. Regardless we soon settled on characters (I'd completely stat up a few characters), ending up with. With no pilot we went with the group being a ground based outfit with a Mule Tracked Cargo Carrier, but no other real change. After a quick rundown of the setting we started with the party being deputized by the Royal Alyeskan Air Police, a number of remote settlements had been attacked by 'heavily armoured men' whom seemingly had no form of transport. The last settlement to report being under attack was the remote mining outpost of Prospector's Reach who radioed a distress call a couple of days previously but hasn't been heard from since. After asking a few questions the party set off in the Mule, taking a few hours to cross the snowfields before spotting a column of smoke on the horizon in the direction of their destination. They found a low ridge to observe the town from, noticing signs of battle and an explosion in the area of the mine. Leaving Kate with the Mule, Stella sneaked into town to do some recon whilst Talon found a vantage point and settled down with his rifle. Quick search later Stella found where the surviving miners had holed up, fetching Kate to speak with the miners who confirmed that the mysterious raiders had indeed attacked them. The raiders were only interested in machinery and mechanical parts, at least until some of the miners attacked them at which point the raiders defended themselves. The miners lured the raiders into a trap that involved blowing up their store of explosives which explained the damage. Promising to get some help the party searched round the town finding pieces of the raiders scattered around by the explosion and tracks leading to the north. Talon checked out the tracks whilst the others investigated the raider parts, some distance out of town Talon noticed tracks leading off from the main group and opted to follow them. Eventually he spotted one of the raiders, though seemingly staggering along, and took aim with his rifle. It took a few shoots before the raider was finally felled, Kate and Stella arrived just in time to see Talon land his telling blow on the raider. Kate then checked out the raider, finding that it was actually an automaton rather than a person. Further investigation they found that the power source appeared to be a strange crystal in the heart of the automaton's torso, plus some Sodkan writing. With the mystery deepening the party retraced the main group of tracks and followed them northwards eventually hitting the coast and the frozen sea beyond. They did manage to spy an island a few miles offshore, but opted to leave the Mule and proceed on foot as they were uncertain about the ice. As they got closer to the island they were able to make out some sort of settlement or work camp, though there was an air of abandonment around it. Exploring the island they found signs of a skirmish, a transport plane that had been recently and partially dismantled as well as a building that had been fortified and was currently occupied. Stella went for a closer look and found that the building contained Sodkan soldiers and an officer who was in a foul mood, though the party elected to leave them alone for the time being. Further exploration revealed the automaton tracks leading into a mine where there was more signs of combat, but the mine entrance was empty and the tracks led to a lift. With no other route to take the party took the lift down to the lower level of the mine, arriving in a large cavern with a number of tunnels that branched off. Taking the largest tunnel which had signs of recent work, the party had to duck into a side tunnel as a pair of automatons came marching by. Advancing further onwards they found another much larger cavern with large machines and production lines building even more automatons...lots more automatons. Deciding that they'd completed their mission they elected to make a tactical withdrawal but found the two automatons from earlier unloading stuff from the lift, so the party made a distraction down a tunnel with some dynamite and made for the lift when the automatons went to investigate. Back topside the party set up more explosives to destroy the lift and mine entrance, though they were disturbed by the Sodkan soldiers. The party ended up hastily departing the island as the mine entrance was blown sky high and the Sodkans took potshots at them, though Talon's return fire proved effective. Arriving back at Prospector's Reach they were able to contact the Air Police who duly sent out help and the party's reward, thus the adventure came to an end. Now that 1d20 levels of sleep have finally been recovered tis time to duly file an After Action Report for this year's UK Games Expo. Travelling down on the Thursday proved to be rather...interesting since a crash on the A14 near Cambridge closed that road which meant the coach driver having to take a detour, also some forgotten roadwork signs on the A11 caused that road to bottleneck for no reason resulting in the coach being an hour and a half late when it finally got to Birmingham. Some confusion at New Street station meant we barely caught our train to Birmingham International, where upon arrival we discovered our hotel was on the other side of the airport...not exactly useful. With the Hilton Hotel only a short walk away we opted to setup our stand to lighten our luggage and went for dinner at Frankie & Bennie's in the airport, probably our most expensive meal during the entire weekend. Luckily the airport had a customer service desk of a sort who very helpfully told us that there was a local bus service that ran past our hotel, one that not only ran regularly but also did so almost 24/7. Dash outside and caught one of these buses, which unusually only accepted exact fare but the driver couldn't have been more helpful and even dropped us right outside our hotel despite the bus stop being a short distance. So Thursday evening we finally got the chance to put our feet up after checking in and getting our room. On Friday the trade hall didn't open to the general public until 2pm but the press had free range from about midday, during this quiet period I took the opportunity to grab some Savage Worlds loot in the form of the Horror Companion, Day After Ragnarok and the GM screen. Friday proved to be the quietest out of all three days, me and Tori only sold a couple of things but I suspect next year Friday may prove to be busier. By contrast Saturday was the best day for sales, the copies of the Savage Worlds Deluxe rulebook pretty much sold themselves and I also managed to sell the postcard prints, some copies of Alyeskan Tales and the Firewater & Ice adventure. Sunday was sort of between the previous two days with regards to how busy it was, which was reflected by sales. But compared to Diceni at the start of May I made four times as much money and Tori sold some of her harder to shift stock. The Frozen Skies game I ran Saturday night was really good even if only half of the players who'd signed up actually turned up to play. The adventure went better this time round compared to when I ran it at the UEA Gamessoc 24 Hour earlier in the years, the tweaks I made certainly improved it. Was dead chuffed to find that one of the players had worked on the D20 RPG Etherscope and was intrigued by the Frozen Skies setting, certainly had alot of interest and wish I was in a position to release it now but oh well. Tori's artwork was a hit, a few people suggested that it would be brilliant for a couple of games whilst a lass from a game company told Tori to get in contact with them. Met loads of awesome people, including Matt McElroy who's the Publishing Director of DriveThru. Also attended a couple of seminars, something that I didn't do last year. Also looking ahead to 2016 and making plans, stuff that I'd do differently or possible stock to have on hand such as more Savage Worlds products. My only complaint is a lack of communication from the organisers, we turned up at our stand just after 9:30am on the Saturday and found the trade hall already swarming with people which meant we might've lost out on some sales. Least we did get told that the tarde halls would be opening early on Sunday, though it would've been nice to have known that it was also the case on Saturday. Wearing costumes seemed to work as it drew some interest, though next year we're going to be making certain that we double check where the hotel is before we book it. Considering running a few games to qualify for a free room at the Hilton, but nothing's set in stone just yet. Following a suggestion from Matt McElroy, the Firewater & Ice adventure is now listed as Pay What You Want. So you can grab it as a freebie or give some money to help Utherwald produce more products. Also, looking at the possibility of changing Utherwald to Iceni Press. Mainly to create a stronger tie to Norfolk (Iceni was the name of a tribe native to the area during Roman times), easier to pronounce and also so that it would appear higher up in a list. Thoughts would be most welcomed.